Don't join extracurriculars freshman fall. Of course, this was not for lack of interesting things to join. I was thrilled about the idea of writing for The Dartmouth, firmly convinced that I needed to start some form of scientific research and eager to give back to the local community by getting involved in volunteering. By the end of freshman fall, however, I had done none of these activities. And I’m glad about that. Freshman fall was amazing, but the first few weeks were stressful. Looking back, orientation was one of my least favorite weeks at Dartmouth. The point of orientation was not lost on me. I knew that the many opportunities to socialize and meet people were important. The problem was that I felt pressure to not miss out on anything. Not surprisingly, the need to constantly be “on” left me exhausted. While broaching the subject with my friends, I found that this idea of burnout was a common theme among first-years in orientation. Maybe it’s because as an introvert I tend to surround myself with other introverts, but many of my friends assured me that they too grew tired of making small-talk and plastering an unwavering smile across their face. Even the extroverts in my life, who genuinely enjoyed this type of social interaction, expressed their desire to get orientation over with and finally establish a daily routine. For first-years, the stress of building a new life away from the pillars of stability of our old high school lives is not insignificant. When everything is new, the little things like figuring out where to go to dinner and who to go to dinner with take up time and energy. 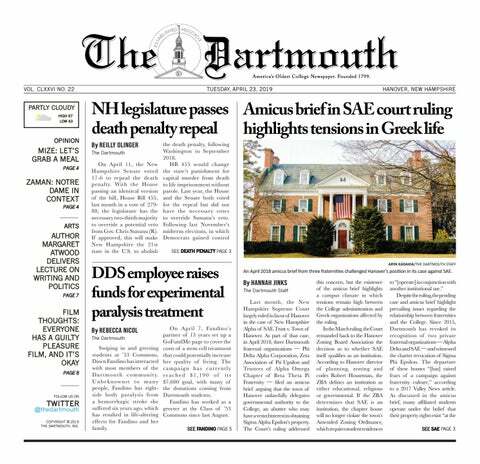 The quarter system also means that midterms are mere weeks into a new term, mandating a fast adjustment to Dartmouth’s demanding pace. That’s why I made the decision to step back from the craze of applications and tryouts and take the time to adjust to my new life at Dartmouth. I spent time reflecting meaningfully on how I wanted my extracurriculars to shape my Dartmouth experience. Although I joined two organizations, Dartmouth Running Team and GlobeMed, they were both relatively low time commitments. I was able to spend my time studying for classes and getting into the swing of Dartmouth. And I suffered no consequences. Unlike in high school, when everything seems to culminate in a battle to get into college, it doesn’t really matter whether students join activities in their first term of college or their second. Although graduate schools certainly weigh factors such as passion and involvement, there is no penalty for taking a term to get a solid footing. I strongly encourage my peers to do so. In a sharp contrast to my own choice, many of my friends went all out: they auditioned for a capella groups, became Great Issues Scholars and tried out for competitive club sports teams. I’ll be the first to admit that I felt a pang when my friends recounted their tales of being woken up early in the morning to screaming club-leaders holding “Congratulations” signs in fine Dartmouth tradition. There were times when I worried that I wasn’t doing enough to build a community for myself, and that my friends would find their new best friends on sports teams and clubs and forget about me. Funnily enough, this didn’t happen. By hearing about the experiences of my friends and learning more about Dartmouth’s clubs and groups, I got a better sense of what would be meaningful for me, and what perhaps what wasn’t the best use of time. I also spared myself some of the crushing disappointment of being rejected from elite groups, which can feel like a big deal as a naïve freshman riding the high of your high school experience. Now, having joined The Dartmouth, started doing research through the Women In Science Program and begun volunteering in the Upper Valley, I am content with my schedule and glad that I waited. I know who to eat dinner with and how to handle the ebb and flow of midterms. I have established a life for myself in Hanover. By waiting until winter term to truly get involved, I gave myself time to adjust. As I’m sure all fine Thayer engineers would attest, I found that building a stable foundation is more important than getting the job done quickly.